Should Used Plant Pots be Washed and Disinfected? There seems to be two camps when it comes to the question of whether or not to wash dirty plant pots. There are those that say that soil is full of organisms and bacteria, so what is the point. And those that say that seedlings require sterile conditions. It is not my favourite gardening task, but I always wash my used plant pots. I do this in order to get rid of any vine weevil, slug or snail eggs that may be lurking under the rims or in compost and to get rid of any powdery mildew or other nasties that may be present. And lastly because I do like to have clean ones to use the following year. I used to wash them with diluted Jeyes fluid, but I found even with rubber gloves on, my hands smelt of Jeyes for hours afterwards. Nowadays I use eco washing-up liquid in a bucket of warm water and an old washing up brush to scrub the pots with, before a final rinse with cold water. 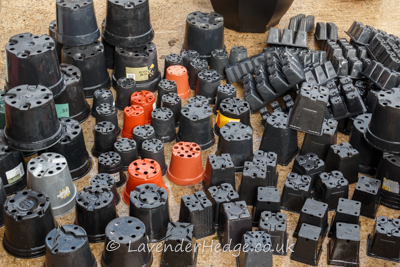 The pots are laid out to dry, before stacking into sizes and storing in a dry place. I always feel quite virtuous when I’ve completed the annual washing of pots ceremony. Pick a warm, calm day to wash pots – they will dry quicker and you won’t end up chasing them round the garden. Do try and clean them in the summer or autumn, instead of waiting until spring, when you will be busy planting seeds. Don’t leave the pots out during the winter as they will become a haven for slugs and snails. If you have any excess pots that you are not going to use, then recycling is better than putting them in landfill – some garden centres have a recycling bin for unwanted plant pots.